BATTLE MAGIC is one of the books I have been looking forward to getting my hands on. Not only is it written by Tamora Pierce, one of my favourite fantasy authors, but I was also looking forward to seeing some of the hints in THE WILL OF THE EMPRESS being explained. Reading between the lines of that book I knew that it was not going to be an easy story – something very bad happened there. Despite my excitement, it did take me a while to get into the world and story of BATTLE MAGICalthough the book itself was a quick read. The Gyongxe and Yangjing regions seem to be very different from the other countries explored in the Emelan series – there is a definite Chinese vibe to the culture, and maybe a little Japanese or perhaps Tibetan in the mix too. It was really interesting to see the different regions, and I think Pierce did a great job exploring the people and the culture without taking away from the plot of the book. The plot of BATTLE MAGIC is a pretty simple one, and places Briar, Rosethorn and Evvy in a reactive position. I think Pierce did a good job of showing the brutality of war without being overly graphic, but at the same time getting across how ruthless people can be. 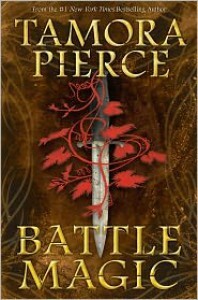 It was interesting to read the battle scenes, though Pierce focused mainly on the magic use rather than the actual fighting – which is understandable as the main characters are magic users rather than fighters. BATTLE MAGIC is a good addition to the Emelan canon, and I am glad that Pierce gave us the reader some insight into the cause of Briar’s nightmares in THE WILL OF THE EMPRESS. If you are a fan of fantasy, particularly sword and sorcery fantasy then you should check this series out.